This April, with Saladin Ahmed on writing and Javier Rodriguez on art... Exiles is back. Iron ManLad's nose is back! In a twist, Khan's post-apocalyptic home will turn to just be a New Jersey. I know I should let Exiles Mimic go....but damn it I loved Calvin. Everytime I see something like this it gives me hope. Right there with you. Get me the originals back, at least so somebody can un-Claremont the disaster that were the later issues, and I'll be happy. Show me what happened with Nocturne and Thunderbird's baby, and I'll be happy. Same, Exiles Calvin was great. This is Exiles, and we're talking about Iron Lad AKA young Kang. It could be an alternate universe Iron Lad. Or an Iron Lad who hasn't done that yet (and maybe never will thanks to time travel shenanigans). Or it might even be someone else in the armor using the Iron Lad identity. There's plenty of ways to keep having Iron Lad as a hero. See, it's a good thing the writer says that's Grizzled Future Kamala because... she don't look that grizzled. No scars, no missing eyes, not even any wrinkles. ... and it may be a knee-jerk reaction and all but... not liking Clarice's new look. It's Kamala. Grizzled she might become, but grim? Never. I'm reminded of a line in a book I read some time ago where the protagonist meets someone who hails from (a) future and asks about herself and how she is there. "Your smiles are not as wide. But your eyes are as kind." And she has a big gun; that counts as grizzled doesn't it? It counts as Mildly Grizzled. For a proper Grizzled effect, one has to have at least one metal limb, a facial scar / missing and / or damaged eye, and a perpetually dour demeanour. She has a facial scar, a big gun and some pouches, but she's not quite at full Grizzled yet. I was cynical when I heard his, remembering how Jeff Parker’s run got cut so short, but dammit, Mini Marvels Wolverine has got me hooked. Although if it had been Elephant Steve I would have been even more hooked. Miguel really could have used their help in Spider-Verse too. As much as I loved that series, maybe they weren't great at their jobs. Now that's a top tier creative team! And on a super hero team I wanted back. On the down side, I don't dig Blink's new look, especially the haircut. And the only thing worse than another alternate Wolverine is an alternate Wolverine who looks like an annoying mascot. Is that Bullpen Bulletins / Mini Marvels Wolverine? Awesome! She's just going by Khan, huh? 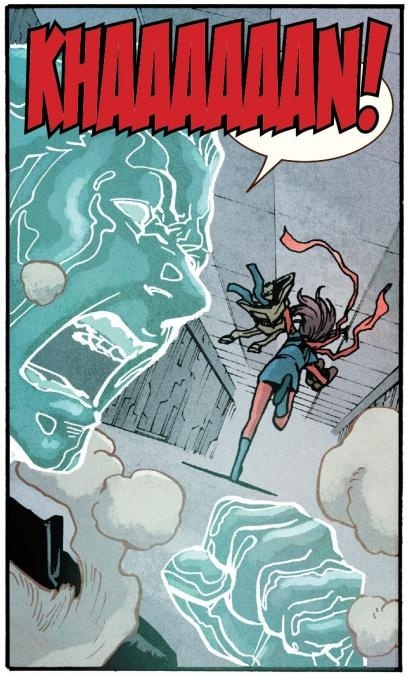 Has the William Shatner, Khan yell been used against Ms. Marvel ever? I remember when I was reading the book I kept expecting it, but then I dropped all my Marvel books when they revoked the free digital copies and haven't kept up. This looks cool, getting back to the what-ifs! I liked the last Exiles mini at first, but then it got into trying to define the backstory with Kangs and such and I don't care. That wasn't a mini, it was an ongoing that got suddenly canceled and the last issue was double sized in an attempt to incorporate all the stuff they wanted to put in (and still had to change some stuff to make it feel like a finale, like that version of Beast wasn't supposed to be gay). Same effect. Backstory retcons or exposition remain one of the things I am least-interested in in exiles! The series was at it's best when they didn't have a home base, they were just traveled around like it or not. -- Hey, nothing's happening to Black Bolt, right?